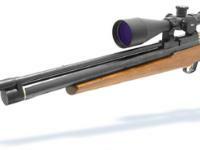 This is the first pre-charged pneumatic air rifle from China. This powerful rifle also features a pistol grip, Monte Carlo buttstock, raised cheekpiece, recoil pad, manual safety and muzzlebrake (it is not a silencer). Warning: DO NOT charge the XS-B50 over 200 BAR, 3000 psi or 20 MPa! This rifle comes with a male Foster quick-disconnect fitting and requires a female coupling to fill the gun with air. You can purchase the female coupling by itself, or you can buy the hose that it fits or you can purchase the coupling installed on the hose. The other end of the hose has a male-threaded 1/8 BSPP fitting that attaches directly to the base of an FX pump or FX electric compressor. Teflon tape should be wrapped around the threads of any air connection before it is screwed together. Things I liked: Handy, well made, affordable price, accurate, powerful, lots of fun to shoot. Things I would have changed: Iron sights would be nice. Maybe some fiber optics. What others should know: The trigger on mine had more curve than I liked. It was easy to straighten as the trigger is brass. I think it's an excellent value. I plan on installing sling swivels and a bipod on mine. Things I liked: quality is very good and I mean good I got the Bam 51 model the only difference is 51 as the thumb hole stock that's the one to go for when fully charged you will get about 50 to 60 shots but around 25 to 30 full power shots in 22cal 950fps 31fbs WOW. Things I would have changed: There is no point having that silencer on it just don't work the bam 50=51 is very loud is there any one out there who knows of a silencer that would fit let me know. What others should know: The fill adapter on my rifle needed a little file down to get the charge adapter to fit which was nothing took like 2 minutes to do and the silencer?? just don't work need bigger one if you know of one that will fit let me know one more thing this rifle is 100% safe.